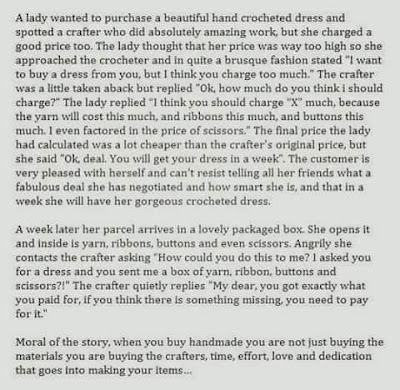 Crafter's, take heed! This is so true! I've personally experienced it before and I also noticed that majority of the humans think like this lady. Our blood, sweat and tears should not be accorded for the likes of her. Mind you, we are not machines ya... we spent our precious time crafting the best we could to provide the best masterpiece for YOU! We should be paid for our hard earned time and effort like how we are paid working in an office as a receptionist or data entry or telephonist. Please do remember to pay for our hard earned time and effort. We did not spent our time doing nothing. 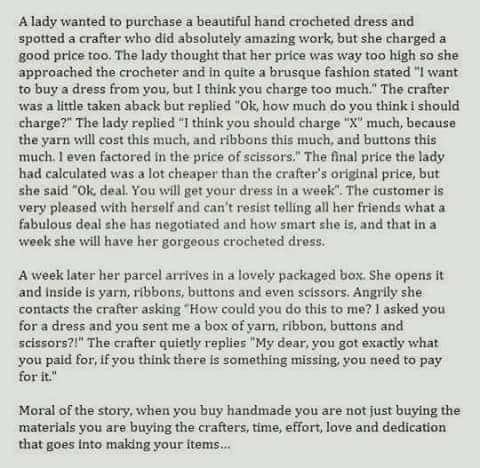 We can't be charging peanuts for a handmade masterpiece too. Thank you.